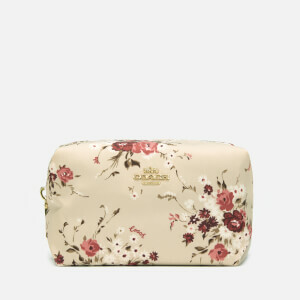 Metallic wristlet pouch from American design house of modern luxury accessories and lifestyle collections, Coach. Crafted from grainy leather, the pouch features a zip top fastening and a detachable wrist strap. Within, the pouch offers a lined interior with two card slots. Detailed with gunmetal-tone hardware, a logo-stamped dog tag and appliqué branding at the front. Dimensions: H: 12cm x W: 19cm x D: 1.5cm. Wrist Strap Drop: 13cm.